To conclude my time in New York, my last meal in the City would also be a first: the first pizzeria in the country that is. 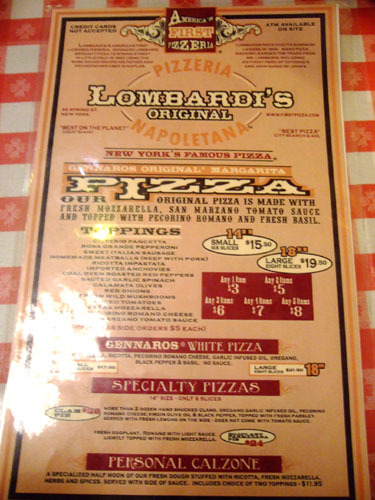 Lombardi's was opened by Gennaro Lombardi over a century ago in 1897 as a grocery store. 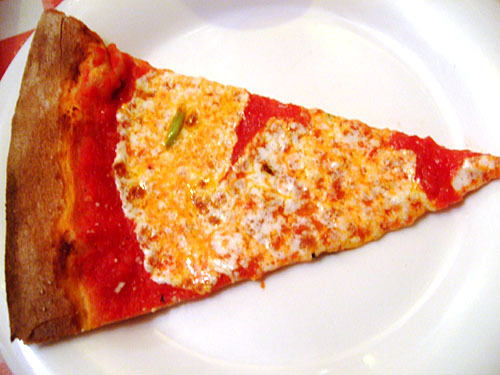 In 1905, employee Antonio "Totonno" Pero began selling tomato pies, which proved immensely popular. 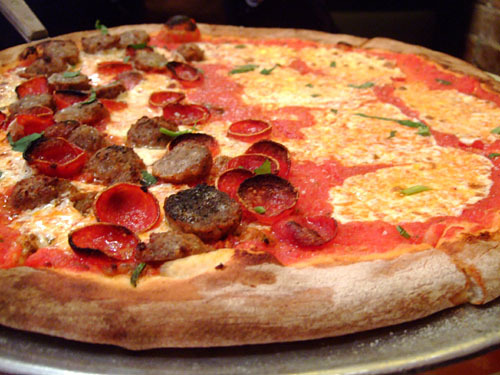 Lombardi's pizza was modeled after the original Neapolitan variety, though mozzarella fior di latte was substituted for Mozzarella di Bufala, and a coal oven for a wood-burning one--thus the New York pizza was born. 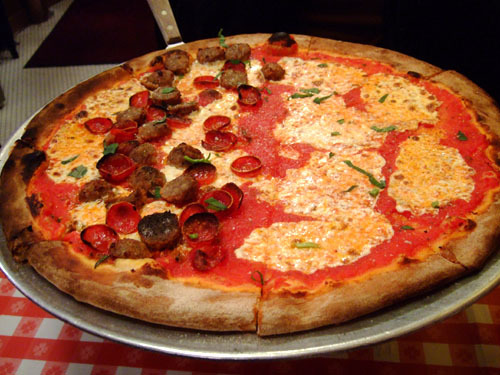 In 1924, Totonno left Lombardi's and opened Totonno's, his own pizzeria on Coney Island that still stands today. Interestingly, the current Lombardi's isn't at the location of the original. In 1984, the original restaurant closed, but reopened a decade later at another address only a block away (the location chosen for its early 1900's-era coal oven), this time under the auspices of Jerry Lombardi, Gennaro Lombardi's grandson, and his friend John Brescio. 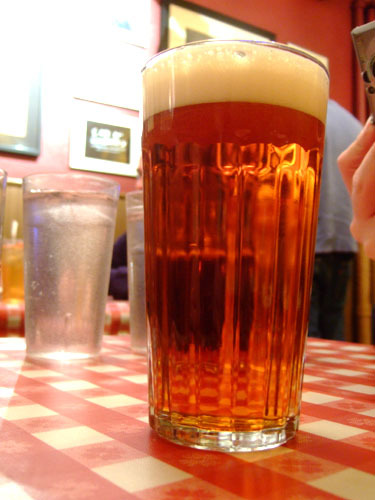 Lombardi's is currently owned and operated by Brescio, with Lombardi having retired from the business. 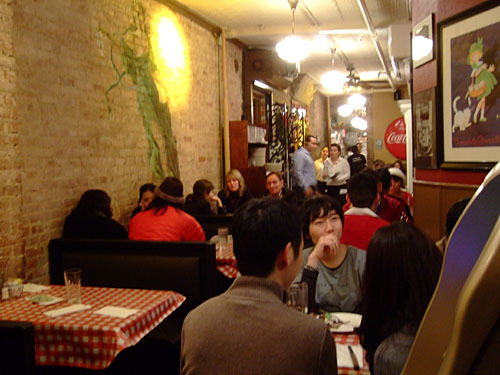 Lombardi's is located at the intersection of Spring and Mott streets in NoLIta (North of Little Italy); the area used to be part of Little Italy, but as Italians began moving out of the vicinity, the neighborhood started losing its distinctly Italian flavor. 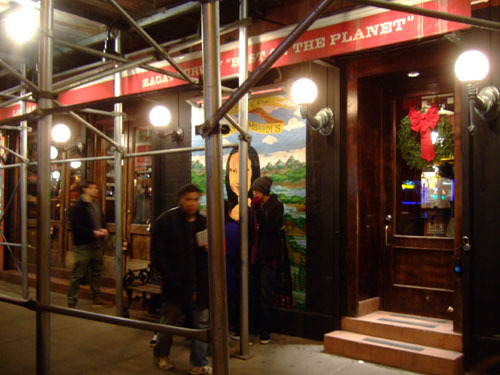 In any case, the restaurant has expanded over the years to meet increased customer demand; in the second photo, the original part of the restaurant is on the right, while the additions are to the left. Here we see the dining room and bar in the newer part of the restaurant, near the main entrance. The new addition nearly doubled the size of the restaurant, reducing waiting times significantly. Pictured above is one half of the original space; the other half is to the right, on the other side of the wall. 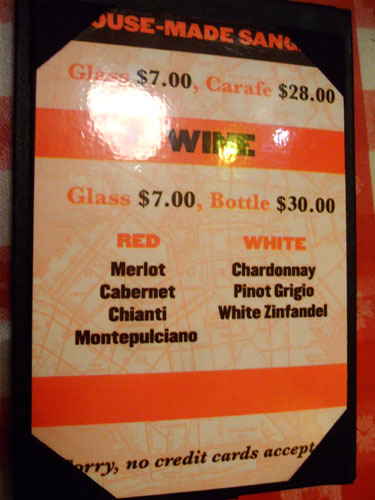 The menu is straightforward; click for larger versions. 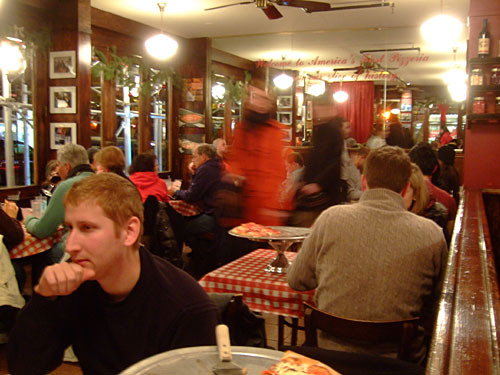 In addition to its classic Margherita pizza, Lombardi's is also well-known for its Clam Pie. The restaurant is somewhat unusual in that it does not sell pizza by the slice. Apparently, that concept was popularized by Patsy's Pizzeria in Harlem. 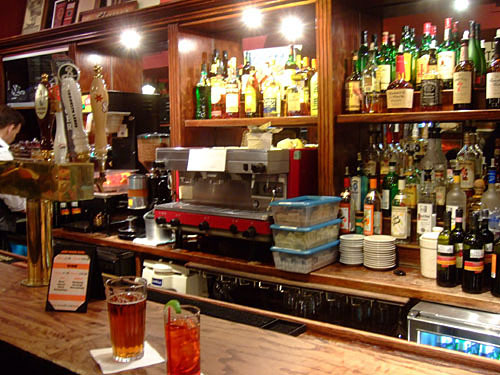 A small selection of drinks is available, including a few locally-brewed beers and some house wine. Nothing fancy, as expected. Click for larger versions. 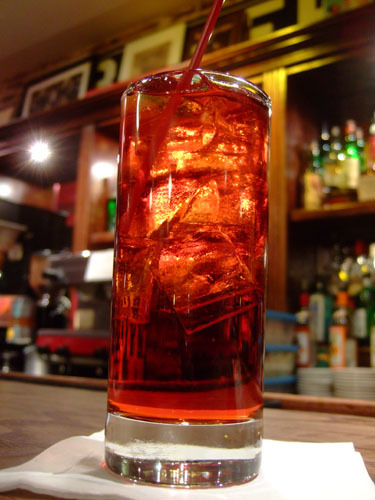 The bar couldn't do a Mojito, so I decided (based on my experience at The Bazaar) on an Americano [$8.00] instead, comprised of Campari, sweet vermouth, and club soda. Surprisingly, the bartender was unaware of the drink, having to consult an electronic guide to figure the necessary ingredients. Though not as tasty as The Bazaar's version (this one being far more bitter), I still enjoyed the drink and found it appropriate as an aperitif. 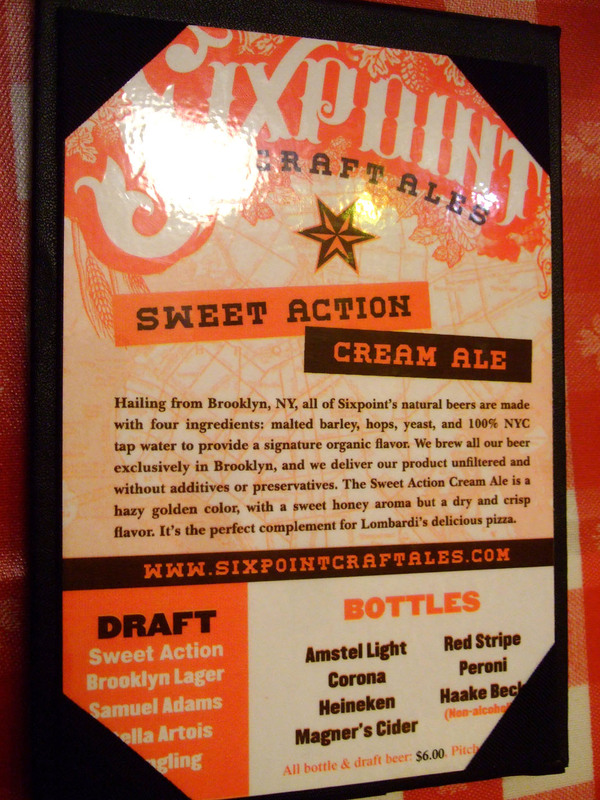 In addition, I also ordered a glass of Brooklyn Lager [$6.00] and one of Sixpoint's Sweet Action Cream Ale [$6.00]. Brooklyn Lager comes from The Brooklyn Brewery and was a fairly typical example of the style--dry and mildly hoppy with a slight bitterness--and paired well with the pizza. The Sweet Action also hails from Brooklyn, and, as can be seen above, was a much hazier beer. It had a nutty, honeyed nose but a surprisingly dry, clean, citrusy taste; I wished it were creamier, as the name would suggest. We decided to go with Gennaro's Original Margarita (Fresh Mozzarella, San Marzano Tomato Sauce, Pecorino Romano, Fresh Basil) with the signature toppings of Homemade Meatballs (Beef with Pork) and Hormel Rosa Grande Pepperoni on one half. The pizza begins with the crust, made with high-gluten flour, which is charred on the bottom by a 900-degree coal-powered heat, giving it a somewhat smoky-bitter flavor; this, however, yields a soft, almost creamy interior. The crust was indeed extremely thin, which I liked, but I thought it could've been crispier. 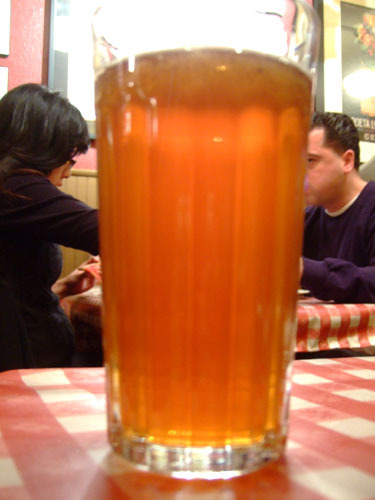 I've heard that the secret to the crust lies in the use of New York City tap water, and that certain pizzerias outside of the City have actually imported said water for use in pizzas! Next comes the sauce (made from puréed San Marzano tomatoes--the only type allowed in true Neapolitan pizza), which was actually quite pleasantly tart, with just a hint of basil. The use of low-moisture cow's milk mozzarella (from whole or part skim milk) along with Pecorino Romano was a nice touch as well, with the Pecorino adding a somewhat saltier tang to the milder mozzarella. Finally, the meat toppings were among the best I've had of their respective varieties, both being extraordinarily flavorful; I especially enjoyed the crispiness of the pepperoni slices. What a world of difference compared to Famous Original Ray's! Perhaps it had something to do with the location, the aura of being at pizza ground zero, but this was truly some of the best, most memorable pizza I've had. My prior pizza experiences have been mostly with chains, so it was refreshing to see pizza done right, by pizzaiolos with a passion, a desire, to do things the right way. The result really speaks for itself, and makes me yearn for a place like this back in Southern California. I remember my friends and I walked out of this place and said "what's the big deal?" Didn't hurt that our crust was mildly burnt! It was good but maybe it was far too hyped up for me so that my expectations for the pizza could never be met. Glad your experience was better than mine and that enjoyed this NY institution tho! If you're hankering for a thin style pizza you can check out Bollini's Pizzeria in Monterey Park (yeah weird place). Wood fire baked oven with a very reasonable price. I'm a big fan of thing crust pizza. You can fold it in half and eat it like a sandwich! This pizza pie looks fabulous. Next time I'm in New York (whenever that may be) this is a must do. I think I'd have to give the clam pie a whirl. Charlie: I liked the burnt crust! I definitely understand the hype factor though. First pizzeria? Yeah that's a lot to live up to. In any case, Bollini's does seem really promising; I've been hearing a lot of good things. Mike: I'm a fan as well. I wanted to do the clam pie, but my dining companion didn't want to. Coming off food poisoning do you think clams really sound appetizing? Does anything really sound appetizing? Bollini's is horrible. Horrible. Go to Casa Bianca. It's not wood fired, but it's still really good. Or check out Pitfire pizza. Wow. Why the hatred for Bollini's? A lot of people seem to enjoy it. Pizza's a polarizing issue it seems. I'm usually not a stickler for pizza. I wouldnt' consider myself a "purist" at all, but the crust at Bollini's was bland and poorly done, the toppings were way overloaded and the sauce was much too sweet. I have no idea where they get the notion that they can call themselves "authentic neopolitan". I haven't been to Naples, but I've been to Antica Pizzeria, which also has the official Neopolitan designation and that one was like night and day compared to the one I had at Bollini's. In either even, go there and try it yourself. I bet it'll be nothing like what you had at Lombardi's. Sorry, I was really disappointed when I finally went there, being that I heard tons of great things about it too. Ah, thanks for the clarification. Perhaps I do need to try it for myself. Are there any other pizza places that you're not keen on? Next time you're in Los Angeles go to Village Pizzeria in West Hollywood. Talk about a good slice! I was visiting from New York City, in fact, and a friend took me. Better than a lot of the pizza places in NYC, and cheaper too. I'm not familiar with a Village Pizzeria in West Hollywood. Did you mean the one on Larchmont or the one on Yucca? Or did you mean Greenwich Village Pizzeria? I believe that both the one on Yucca as well as the one on Larchmont are owned by the same people, but I went to the one on Larchmont Blvd. Sorry, I'm not very familiar with L.A.! Yeah I think Grimaldi's was previously known as Patsy's. I do want to try both of them eventually, and Di Fara as well. 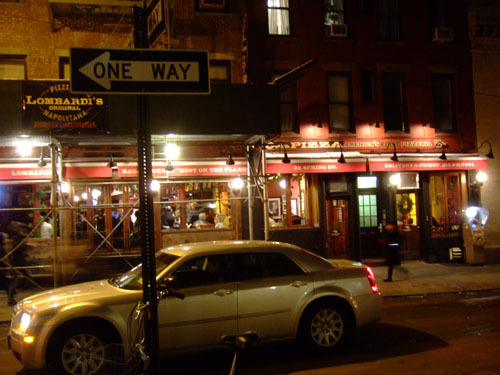 I tried Lombardi's and Grimaldi's last month, and Lombardi's wins by a nose. It's a shame you didn't try Lombardi's roasted marinated red peppers as a topping. They cook them first in the coal oven, giving them a slight smokey flavor as well as a little char. Then when they are put on your pizza, all they have to do is heat up. Perfecto! At Grimaldi's the marinated peppers were taken right out of the jar. Because these thin crust pizzas cook so quickly, the red peppers were a little slimey. Also Lombardi's sausage was much better. Again pre-cooked and then thinly sliced like a deli meat. 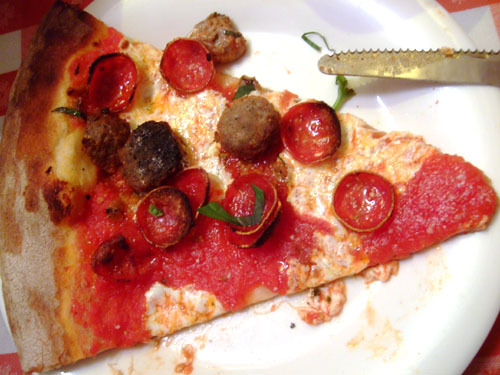 Grimaldi's put on crumbled raw sausage. While it had a nice flavor, it was a little gristley in parts. I think you've had the best of the two pies. 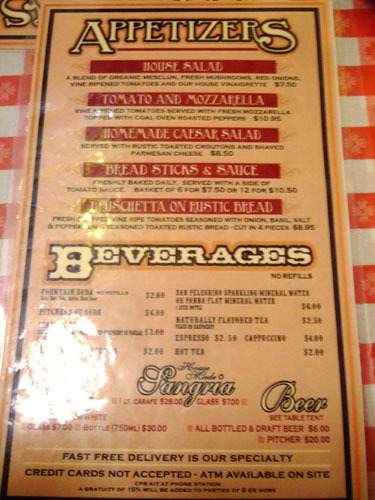 And both are better than anything I've had here, although Tony's Little Italy in Placentia is Chicago Deep Dish at it's best. But you can't compare Deep Dish and Thin Crust, they are two different animals. Hey thanks for the very detailed report back on the two places Dave! 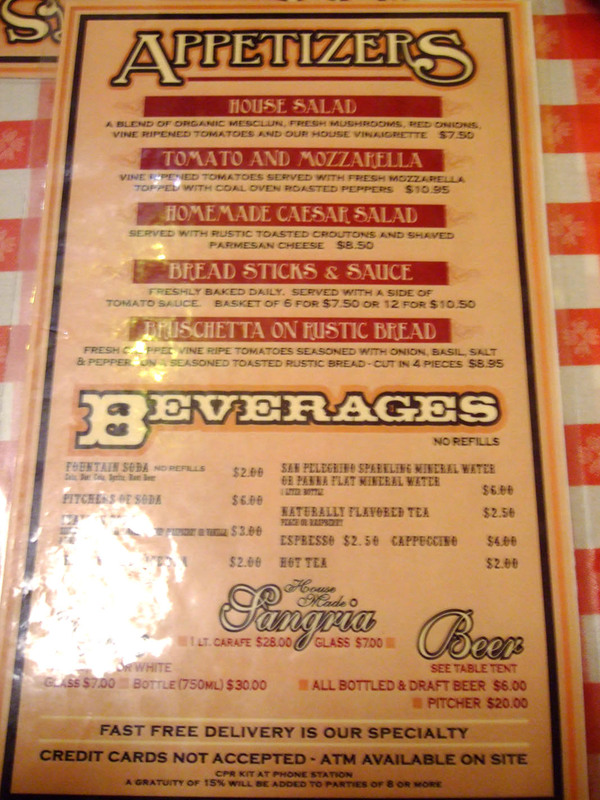 I still would be interested in trying Grimaldi's if I'm ever back, and the much-hyped Di Fara too. Lol. "Entire universe" is a bit of a hyperbole I'm sure. Is it even the best in NYC? Most would say no. I actually wanted to hit up Di Fara last time, but the distance (we were staying in Midtown) and potential ginormous line kept us away. If you ever go to NYC again..I know its not Pizza but the Halal cart specifically for the lamb is very good...truly live up to the hype. There are some cool drinking places also. The one top chef place I did visit was Morimoto, to me the Omakase was more like Ikko good but sushi wise not exceptional. Maybe I had too much expectation as well. If morimoto made it himself it might be different. Morimoto is kinda like Nobu to me. Yeah I've heard a lot about the cart--will try to seek it out next time. Morimoto is way down on my list to try in NYC though. I would try it out in Philly however.